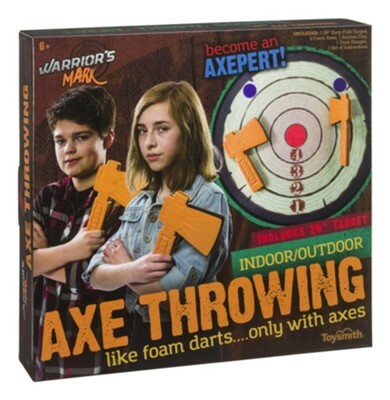 Perfect your target practice with the Warrior's Mark Axe Throwing Game from Toysmith. Designed for ages 6 years and older, this foam axe precision game can be played inside or out---just take aim and throw your foam axe at the target! Includes 26" diameter easy-fold target, 2 foam axes, suction cup, door hanger, instructions, and a drawstring storage bag. I'm the author/artist and I want to review Axe Throwing.